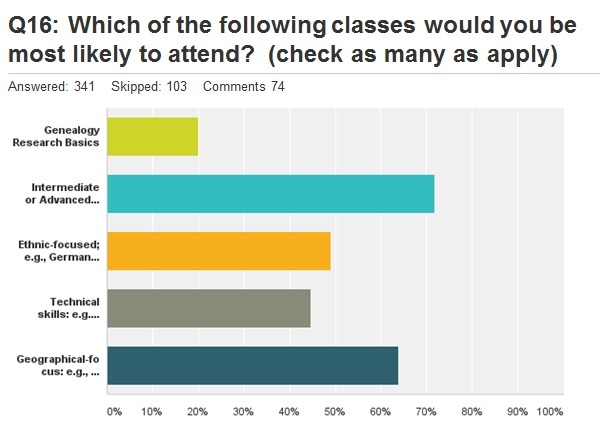 Thanks to your fantastic response rate to our Fall All-Member Survey, we heard loud and clear that you (our members) value our classes, on-line sites, social media channels, and eNews. We also learned that even in this digital age, you especially enjoy our bi-annual genealogy journal, The California Nugget. Thank you. 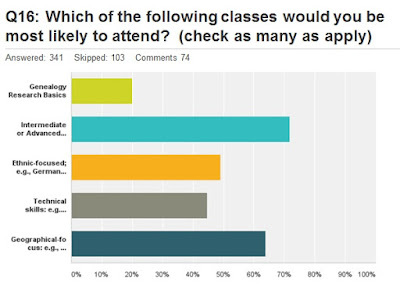 In terms of education, what we have learned is that you are clear about the topics and level of classes you want to see. This included more Intermediate and Advanced genealogical learning opportunities, more about DNA and classes focused on specific ethnic groups and localities. You also want to improve your technical skills. Ethnicity and Geography: French-Canadian, German, Irish, African-American, Jewish, Nikkei Pilgrimage, Angel Island, Western Pennsylvania, and Locations Basics. Technical: Spreadsheets (repeat of Susan Goss Johnston class), Creating a Blog, and Optimizing FamilySearch. Intermediate and Advanced: Repeat of Susan Goss Johnston Advanced five class series, National Archives, Forensic Genealogy, Handwriting, and Certification. DNA: DNA for Beginners (quarterly) and DNA for adoptees. The 1st quarter offerings are now on Eventbrite and more will be added soon. We're currently in the planning stage with other instructors. The classes listed above do not include the activities of our very popular San Francisco and FamilyTree Maker Special Interest Groups. We'll report more about their plans as they become available. This Fall there will be an All-Day Event with Cyndi Ingle of Cyndi’s List (not yet on Eventbrite). We're so excited to have Cyndi come and speak---mark your calendars for November 5th! Thank you for your feedback. We hope that you'll be pleased with this year's class line-up.